New Star Manager is the latest entry in Simon Read’s series of football titles, New Star. This time around you play as the manager of a football team, this means you manage everything. This goes from training the players, to constructing different facilities, hiring sponsors, receiving requests for interviews, and so much more. New Star Manager tries to do a lot of things, it implements a great variety of options and gameplay elements, but the issue here is it may be daunting to receive all these tasks at once. With a game like this having so many menus and options, it’s easier to explain it with a quick rundown of the gameplay. For that, here’s a quick summary on the main gameplay elements. There’s a lot to do in the game’s main menu. In the left side you can check on the various icons, these are different facilities that you can build to get better performance, get new players, train alongside others. These facilities have different levels of utility, each can be improved using the in-game currency. On the upper side there’s a help icon that contains a list of everything to know about the game (very useful for those that didn’t understand something explained in the tutorial), a Manager screen where you can look at all the career stats and achievements, a Players List that helps recruiting player with certain requirements, Board targets that gives benefits to the player, Coaching cards that can be given to players to improve their playing style and finally an area where you can check on the amount of money you have. But that’s not all, on the bottom side there’s the home screen, League (information table), Squad, Staff and Club. Staff is important because after every game you can earn some cards that are used to improve your game. Getting as much staff as possible makes getting these cards all the more accessible. There’s a few other things you can do as well, like take part in interviews for example. That’s a basic rundown on the menu, but what about the matches themselves. Well, before a match starts, players can manage the team in the field, check each player’s energy, see their ranking, change the group formation, and see the leading players, alongside a few other things. For those that have trouble making the correct team formation, there’s a handy “Assistant Pick” to help choose the best options. Players in the field have an energy bar, the lower the bar the more tired they are, and that leads to slower movement, easier to get injuries and drop in motivation. To raise their energy players can give each team member some energy cards. Right before the match begins, players also have the option on how the team should play (offensive, defensive…) and increase or decrease their work rate. Once the game begins, the player will not play or see the match, instead they will see a tab that shows the important information on what’s happening in the game. In certain segments however, players will be able to manually control the team and take the shots. Here you control the teammates and use moves like dribbling, shooting, curling the ball, slide tackling, retries, alongside some other more complex moves. These segments are on the short side but bring out the most fun. Once the 90 minutes of a game has passed (usually three minutes of actual gameplay), players check the final results of the match. There’s a few other things to do in the game, and a lot of it has to do with checking out stats and playing the right cards at the right time. Even though I simplified the game’s mechanics to explain a bit more on how the game worked, it’s still a lot of information to take in. The initial tutorial tries to throw all these different elements at once and it may get confusing, or feel like a hard pill to swallow. But luckily, most things the game has to offer can be fully comprehended with the right amount of time. The game can be played with a controller or with the Switch’s touch screen. New Star Manager is best played in small burst, average game time around five to twenty minutes at most. Because of this, I usually played in handheld with the touch screen since it’s a bit more accessible to this play style. As mentioned earlier, you’ll be needing to use the in-game currency to fund new installations and pay the team members and staff. But early on in the game, resources are limited and spending all the money can leave you in a rough spot during a good proportion of the game’s run. Later on, when attracting sponsors and fans, you’ll earn more money, but it never felt like enough to leave me comfortable when spending it. The best part about playing is going into a match, getting a chance to strike a goal and winning a point. But when missing, it can be heartbreaking and leave you with the feeling of “I should’ve shot a bit to the left” or “I should’ve kicked from closer to the goal”. Fortunately, there’s an option to retry a shot once per game, which has helped in a lot of situations. For those that don’t have time to delve into all the in-game stats and the development with each character, there may not be much to enjoy out of New Star Manager. The game heavily relies on looking into every aspect it offers, from renewing contracts, to correctly responding to interviews, to keeping your players happy. One slip up might cost you a lot of time put into working towards a goal. The game’s presentation doesn’t go for anything over the top. Most of the game revolves around going through menus and checking all the stats. When playing a match, the characters and the field lack any sort of detail. Since the camera is set with a top-down view, most character models look the same. Lastly, New Star Manager’s soundtrack is anything but remarkable. There only one track in the game and it isn’t catchy or unique to hear. The sound effects however, are accurate to what they would sound like. The kick of a ball, the cheers of the crowd, the whistle of the referee. 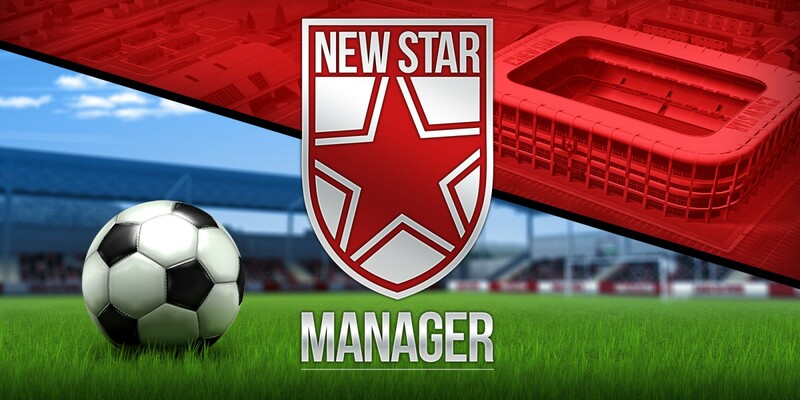 New Star Manager does a lot and gets most of it right, it has a good amount of content, offers an extensive amount of replayability and it’s easy to play in short bursts. There’s some minor issues like the short amount of in-game currency one gets initially, the overabundance of information in the game’s lengthy tutorial or the overall decent visual presentation and lack of a soundtrack. If you like football or simulation games, then this could be for you. If not, I can’t recommend New Star Manager, as there won’t be much fun to be had.